The assertion that the moon has been more thoroughly researched than the deep sea is still true. The deep sea refers to the totally dark layers of the ocean below around 800 metres. Submersible robotic vehicles that can penetrate to the deepest parts of the ocean, the deep-sea trenches, have been in use for some time, but expeditions with these are expensive and complex. So our knowledge of life at great depths is still fragmentary. At best, submersible vehicles provide only highlights in the vast darkness, and sea-floor samples obtained with grab samplers or trawls deployed from research ships allow only isolated snapshots of the deep-sea ecosystems. 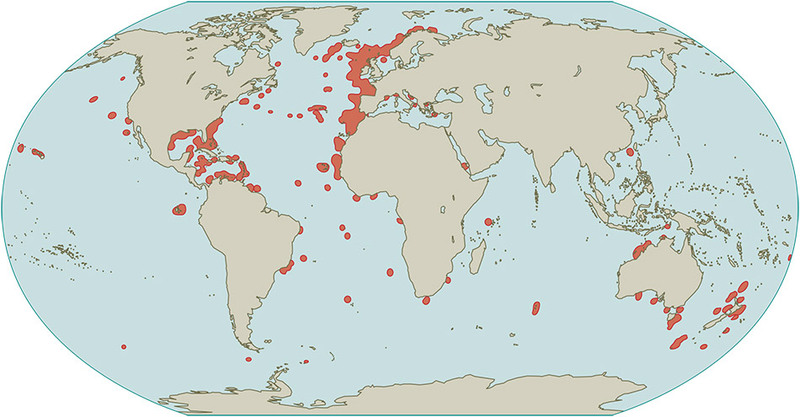 Although the impact of human encroachment on these systems is largely unknown, the deep ocean regions have been fished since the end of the Second World War. At first, fishing mostly targeted species of Sebastes, at depths of only a few hundred metres. Now fish are being caught from depths around 2000 metres, where the living conditions are fundamentally different from those in shallow regions. The Food and Agriculture Organization of the United Nations (FAO) defines deep-sea fisheries as those conducted between the depths of 200 and 2000 metres. Off northwest Europe the transition from land to the sea bottom is a gradual slope. Off the coast lies a sprawling continental shelf. The North Sea is situated here as a shallow, offshore marginal sea. A similar situation is found off the coast of China with the South China Sea. The wide continental shelf ends at the break to the continental slope, which falls more steeply to greater depths. There are also coasts, however, where the transition from the land to deep sea is more abrupt. Here the wide continental shelves and marginal seas are absent. An example of this is the coast of Japan, where the sea floor descends abruptly and steeply into the depths. Distinctive structures rise from the sea floor all around the world: submarine banks, ridges and seamounts. 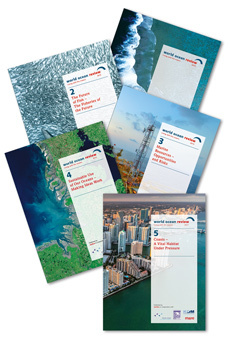 A bank is defined as a sea-floor elevation that can be several hundred kilometres long or wide. Banks are composed of sandy material or massive rock. The kind of fish that predominate in an area depends in part on the bottom characteristics. Individual fish species have different modes of life. Some live close to the bottom. They are demersal. Other species swim in the open water column and are called pelagic. There are also species that live near the bottom, but rise into the water column to hunt for food. These are benthopelagic species. It is amazing that special biological communities have developed in the deep sea in spite of the darkness. Most of them have only been superficially investigated and biologists are constantly discovering new species that have not yet been described. In recent years researchers have been focussing on cold-water corals in particular, as well as the ecosystems around seamounts and at deep-sea hydrothermal vents and cold seeps. The great biological diversity discovered here was completely unexpected because the deep sea had long been considered to be a dead and muddy desert. The species diversity in the deep sea was sensational for researchers. Seamounts are underwater mountains that are formed by volcanic activity and rise at least 1000 metres above the sea floor. Some are 3000 or even 4000 metres high. Their peaks often rise up into the upper layers of the mesopelagic zone. Seamounts can be regarded as islands or volcanoes that do not reach up to the sea surface. It was long believed that these were rare occurrences. Today it is known that seamounts are present in all oceans. The total number is estimated in the thousands. Research has shown that some seamounts are home to communities of unique, endemic species. These include lower animals like sponges and sea cucumbers, relatives of the starfish, but also vertebrates such as fish, which can occur in large schools around seamounts with high species diversity. This makes the seamounts especially interesting for fisheries. 3.14 > Seamounts are commonly located at volcanic structures such as the ocean ridges, and sometimes form long chains along the sea floor. Seamounts with a height between 1000 and 3000 metres are marked in red, those higher than 3000 metres in blue. 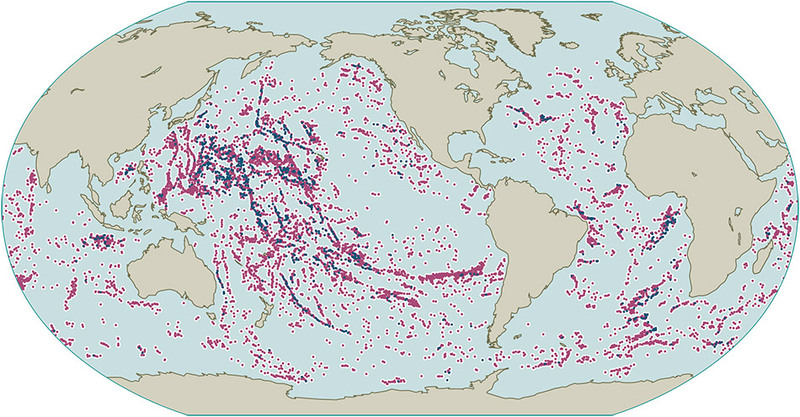 There are still many unanswered questions regarding the significance of seamounts. Many scientists believe that seamounts act like gigantic stirring rods in the ocean, where small-scale eddies break off from the large ocean currents. It is presumed that nutrients and dead plant and animal remains from the epipelagic are trapped in these eddies and attract fish. That would be a logical explanation for the high diversity at seamounts and the sometimes very high fish densities. It is also known that migratory birds on their transoceanic flights and large predatory fish like sharks commonly hunt and feed in marine regions with seamounts. Furthermore, sharks apparently use seamounts as geomagnetic orientation points and sometimes mate there in large groups. Elsewhere, bigeye tuna may converge to hunt among the dense schools of prey fish. An example of this hunting is seen in eddies over the Hawaiian seamounts. Corals usually evoke a mental picture of idyllic South Sea Islands, white palm beaches and swarms of colourful luminescent fish darting through clear waters suffused with light. Actually, however, some coral species also live in cold, deep water layers. They occur primarily in the Atlantic, off the coast of Norway or northwest of Ireland, but they are also found in the Pacific near Australia and New Zealand. It has been known for centuries that there are corals living in deeper waters because fishermen have often found pieces of them in their nets. Until 20 years ago, however, no one had any idea of the areal extent of cold-water coral reefs. 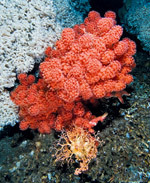 While searching for an ideal route for a pipeline in 1982, workers for the Norwegian energy company Statoil discovered large populations of the cold-water coral Lophelia pertusa. The underwater photographs caused a sensation at the time. 3.15 > Cold-water corals occur worldwide. They can even flourish at depths of 2000 metres. Today it is known that the Norwegian coral reef has an area of around 2000 square kilometres and, in terms of size, exceeds even the warm-water coral reefs in the diving grounds of the Seychelles. A great number of rare and even unique species live on the Norwegian coral reef. Furthermore, these reefs serve as a nursery ground for fish, providing an effective retreat and protection area for the offspring. The term “cold-water coral” does not refer to a particular species. It includes around 1000 species that thrive in cold water at temperatures between 4 and 12 degrees Celsius. Many of them occur in the mesopelagic zone between 200 and 400 metres of water depth. Some species, such as the Antarctic deep-sea coral Flabellum impensum, can live at depths down to 2000 metres – at a water temperature of around 1 degree Celsius. Reefs Reefs are narrow, elongated elevations on the sea floor. Coral reefs are composed of the carbonate skeletons of corals, which have built up to form reefs several metres high over thousands of years. Mussels can also build reefs. In addition, there are reef-like sand banks and rocky reefs.